I learned how to make hummus from a friend who learned from his Turkish next door neighbor. Is that the way recipes should be? Hummus is a puree made from chickpeas and tahini. Tahini is basically peanut butter made with sesame seeds. At my grocery store it is in with the Italian/Greek food items. To boost the sesame seed flavor I like to add toasted sesame seed oil which can be found in the Asian foods section. This is also a great addition to stir fry or curry. I love hummus and a little container is several dollars at the grocery store. 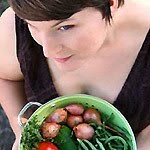 It's very easy to make a large quantity cheaply with ingredients you can find in pretty much any market. 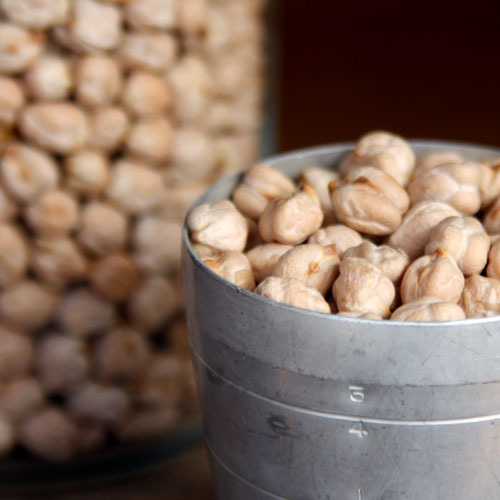 I choose to use dried chickpeas (also known as garbanzo beans) because they are tastier, cheaper and healthier than canned. All you have to do is remember to start soaking them the night before. 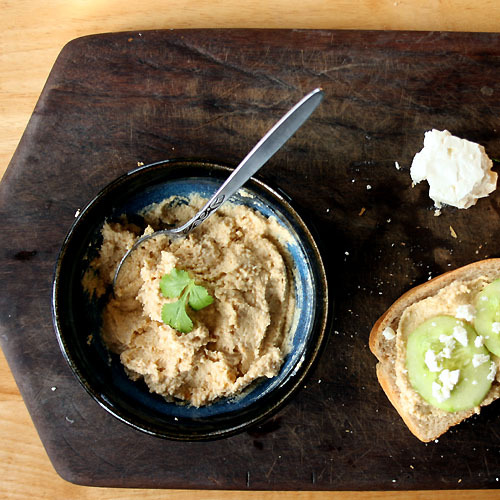 We eat hummus with fresh bread, veggies and feta cheese for dinner about twice a month. Hummus also makes a great lunch or afternoon snack. It is high in fiber and has a decent amount of protein especially for a meatless dish. Soak the chickpeas over night than boil them for thirty minutes to an hour until they are soft enough to smash with a spoon. Drain the chickpeas saving about a half cup of the water they were boiled in. Saute the onion and garlic in the olive oil, until the onion is transparent. Put the sauteed onion and garlic plus all the other ingredients in a food processor or blender and process until smooth. Add some of the reserved chickpea water to get things moving if you need to. In Panama we used a hand-crank, clamp-on the counter type grinder and it worked just fine. There are lots of ways to enjoy hummus. I adore hummus as a dip for crackers or served with sliced cucumber, bell pepper, carrots, and Kalmata olives. It's also good with some crumbled feta cheese, on fresh bread or if you make it thinner as a salad dressing. This recipe was featured on Simple Lives Thursday. Yum! I've never used onion in hummus before; I'll have to give it a try! Using sesame oil and cayenne also sound great. Next time I make hummus I'll try it this way. It's really funny; your 'tahini is basically peanut butter' phrase is exactly what I say to get people to try my peanut butter hummus! They're always skeptical but they always love it! If you try using PB sometime you'll find it's a little different but perfectly delicious! I made the substitution once in college and now it's a favourite thing to make. I love hummus...I too have never made it with onion. I usually put the garlic in raw but I like the stronger flavor. Just a clove or two depending on how big they are. Other than that pretty much like mine...Great post! I love hummus. Unfortunately I am the only one in the household who does so I rarely bother making it. Your recipe looks delicious. Hummus has been a new thing for me over the past year. Before I had my daughter, garlic was not my thing. Surprisingly after I had her, I liked garlic and cilantro. Strange, I know. So of course when I tried my bff's hummus recipe, I loved it. Your's sounds amazing and super easy. Thanks for a real recipe for this, not made with canned chickpeas. Looks delicious. I am a huge hummus fanatic. I can eat a whole bowl all by myself with some warm pita. Thanks a lot.